It’s dinner time, and you’re out of ideas? 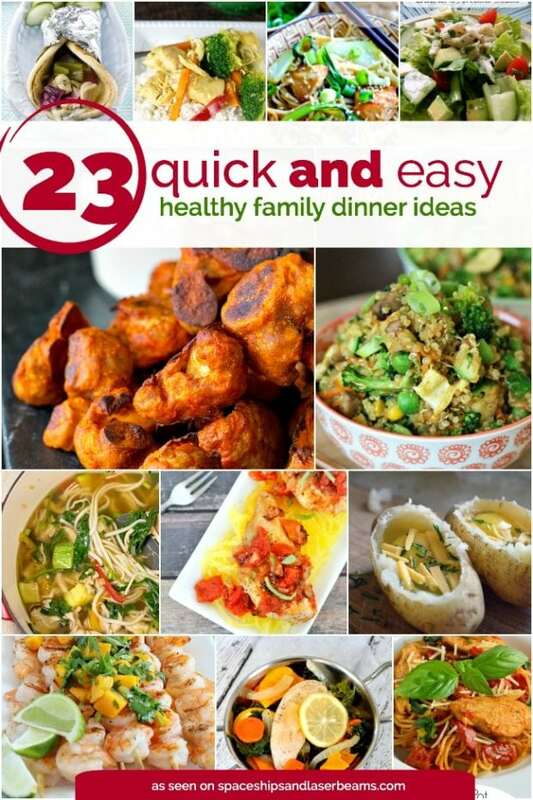 You need some quick and easy healthy family meal ideas. We’ve rounded up 23 of our favorites for you to try. From Thai meatball lettuce wraps to Mexican pizzas to grilled lime coconut shrimp, there is a huge variety of meal options to delight all sorts of palates! Let us know which one you’re going to try first. Plus, don’t miss this delicious chili mac recipe — it’s one of the most popular on the blog. It’s called my Best Ever Meatloaf for a reason — you’ll love it, too! Enjoy this Old Fashioned Chili recipe with your family. Easy and delicious! Our whole family enjoys this baked ziti for dinner. I am all about making life easier when it comes to cooking, especially when the kids are in school. 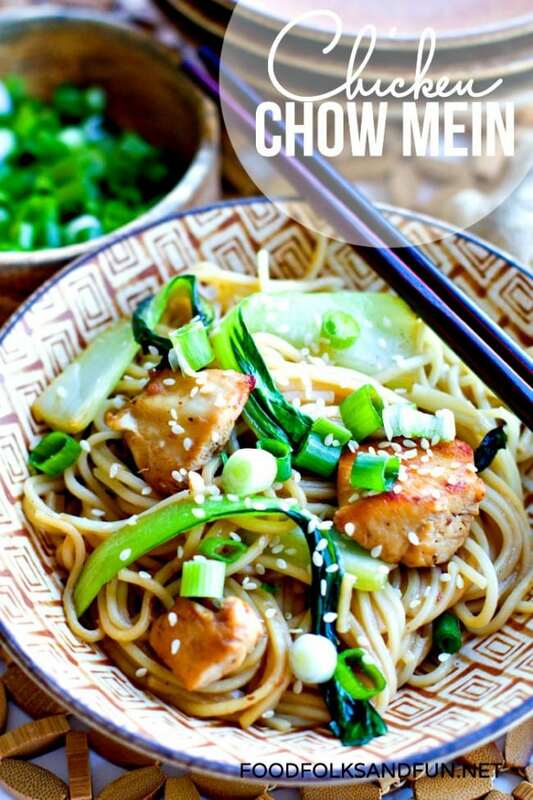 This Chicken Chow Mein recipe is not only super easy to prepare, but SO delicious! It is a tasty and filling meal full of healthy and flavorful ingredients. Asian egg noodles are tossed in a savory honey sesame sauce then topped with marinated grilled chicken, sliced green onion, and any garnishes of your choice. Our favorites are sesame seeds and black pepper. 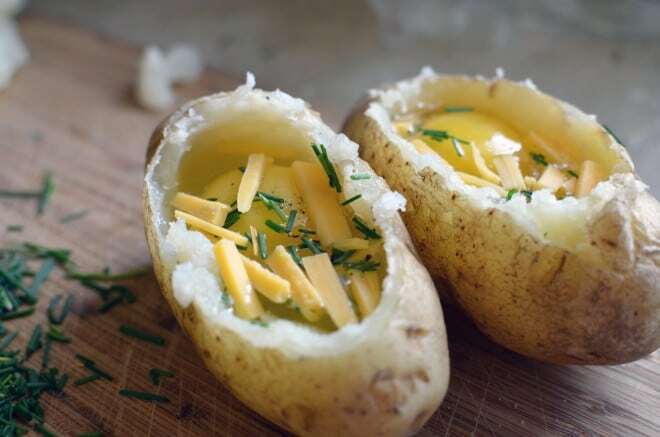 One of my favorite lunches growing up was a microwave baked potato covered with butter, sour cream, cheese, and all those other yummy baked potato toppings. This recipe is a fun twist on the classic baked potato and it is just as simple to make. An egg is baked right inside a baked potato and topped with grated cheese and fresh chives! Plus, it is an insanely cheap dish that makes a relatively healthy and filling meal! 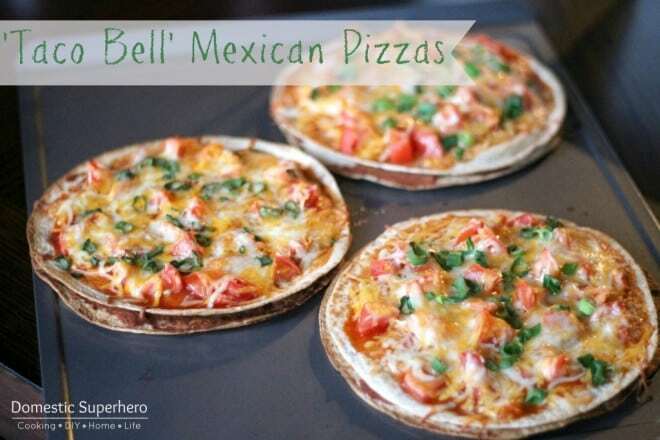 With less than 400 calories per serving, you can feel good about serving these copycat Taco Bell Mexican Pizzas as a fresh family meal. Whole wheat tortillas are topped with a savory homemade enchilada sauce, a blend of shredded cheese, diced tomatoes, refried beans, and sliced green onions. Put these quick and healthy pizzas on your weekly menu as soon as possible, your family is going to love them. 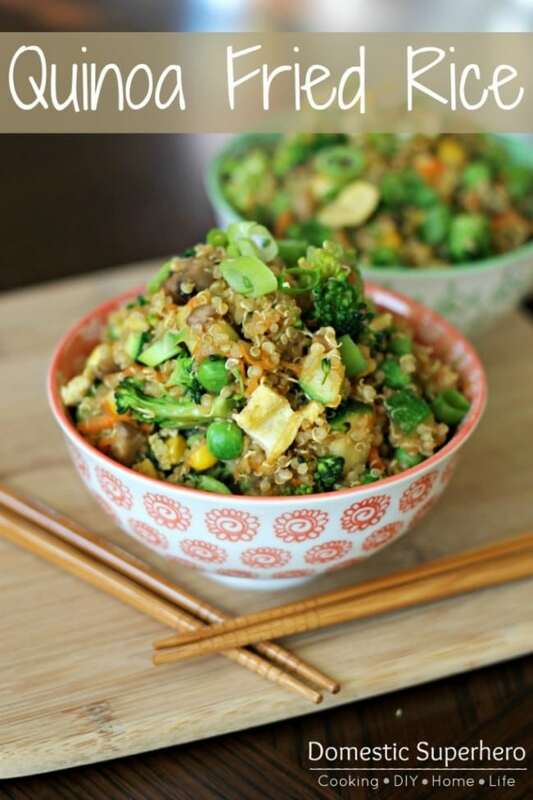 Quinoa Fried Rice is the perfect lower carb make at home version of the classic fried rice. Perfectly cooked quinoa is made in one pot and loaded with fresh broccoli, mushrooms, carrots, peas, and scrambled eggs. It is a perfectly easy dish that makes a great dinner side or a simply delicious lunch. Everyone in the family is sure to love it, and trust me, you won’t even miss the rice after you taste the quinoa! If you’re looking for a classic take on fried rice, try this better than take out fried rice that we all love. 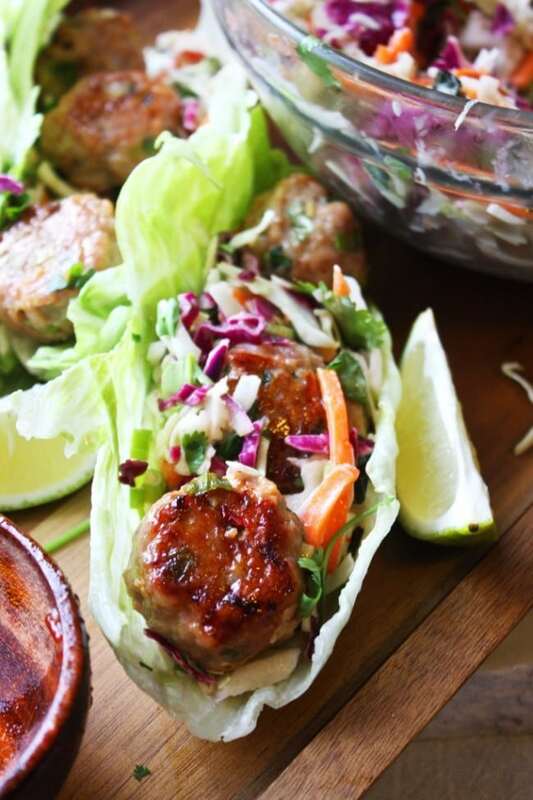 Fellow Thai food lovers will go crazy for these fantastically fresh Thai Meatball Lettuce Wraps. The meatballs are bursting with flavor from garlic, ginger, scallions, lime a sriracha that are mixed in with the meat. The spicy sweet pop from some sweet chili sauce only adds to the scrumptious morsels. These flavor bomb Thai meatballs rest on a bed of coleslaw and mint dressed with creamy, tangy rice vinegar dressing. 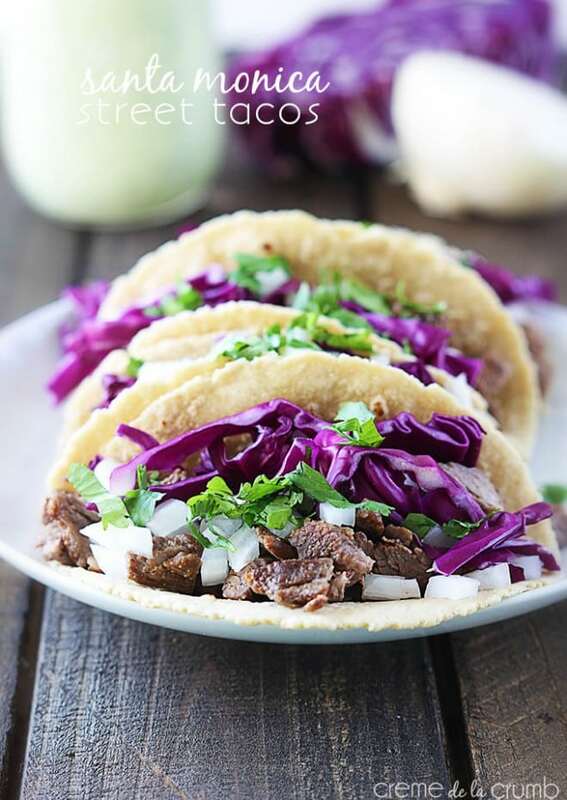 Have you ever had street tacos? Street tacos are the best, most authentic tacos you can get anywhere and one of my favorite on-the-go meals. These Santa Monica Street Tacos are made with fresh ingredients perfect for a summertime dinner. Flavorfully seasoned steak cooked to perfection and wrapped in a white corn tortilla, then topped with cabbage, onions, and a cilantro lime vinaigrette. Plus, they are done in less than thirty minutes with no oven required. 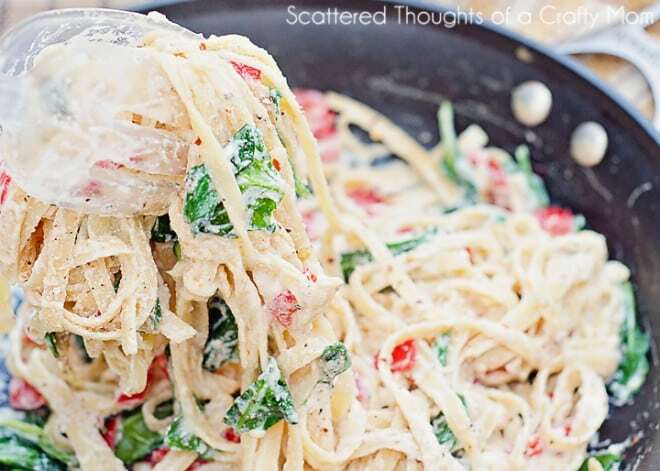 If you enjoy simple and light pasta dishes, then you will love this Lemon Ricotta Pasta with Spinach and Red Peppers. The combination of fresh squeezed juice from Meyer lemons and creamy ricotta cheese is incredibly refreshing and delicious. With simple, fresh ingredients and less than thirty minutes of your time, you can recreate this wonderful dinner dish for your family tonight. 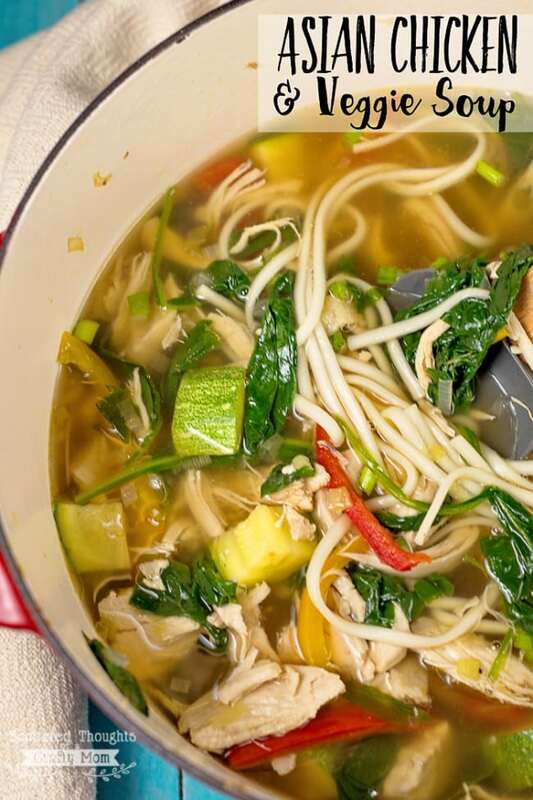 This Asian Chicken and Veggie Soup is packed full of healthy ingredients that make for a delicious and nutritious family meal. Fresh ginger and sesame oil give the soup a touch of Asian flavor and a scoop of sriracha sauce adds the perfect bit of spice. Fresh vegetables and tender shredded chicken breast add the most amazing flavor and make for a low-calorie soup. 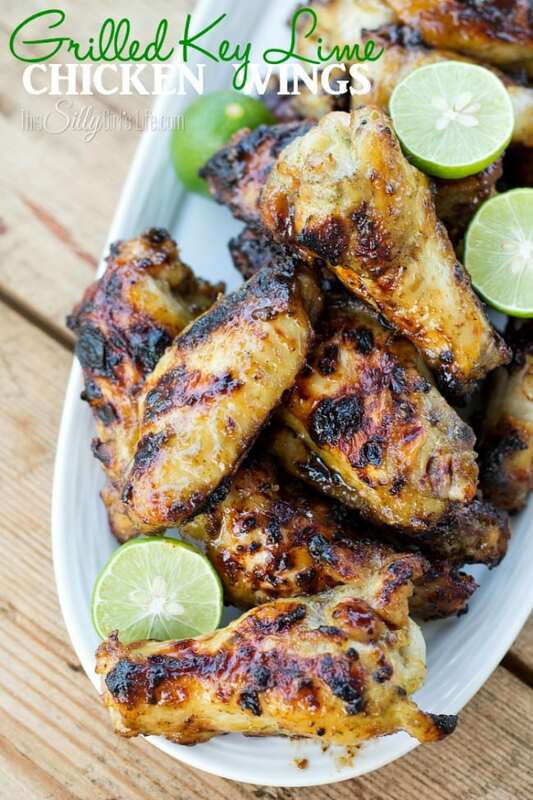 Grilled Key Lime Chicken Wings are marinated for hours in a sweet, herbaceous marinade with a hint of key lime for a deliciously fresh taste. Key lime juice gives these wings an extra special touch. You can really taste the flavors of the key lime in the marinade, offering a tarter flavor. After the yummy glaze is ready to go, the chicken wings are grilled to caramelized perfection with no need for extra sauces. 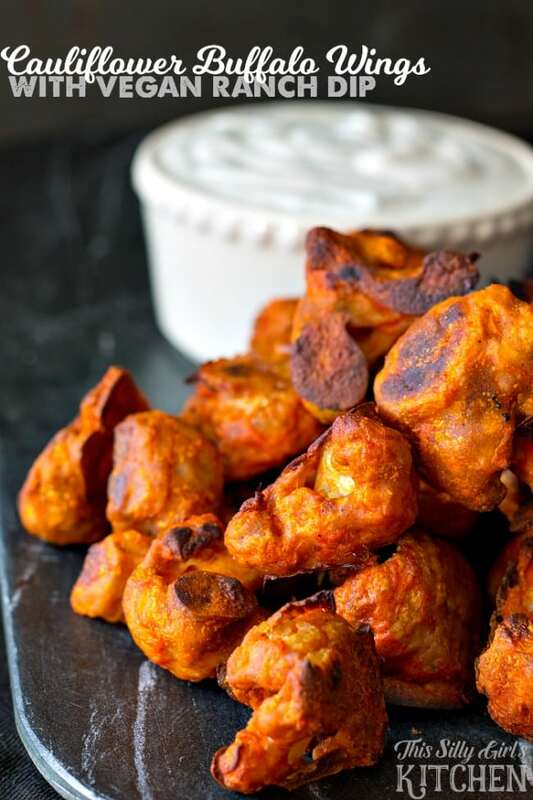 A guilt free version of the popular football snack, these Cauliflower Buffalo Wings with Vegan Ranch Dip is perfect for a meatless Monday night. They are packed with a huge flavor punch and super easy to make for a crowd as well. If you are looking for a new game night recipe, this might just be it. There is nothing wrong with experimenting with new recipes, especially ones that are fun and healthier twists on a classic dish. With the everyday business of school activities and homework projects, regular stuff like cooking dinner can get a little bit difficult. Thankfully, we can all embrace one pot meals like this paleo one pan Italian chicken to make dinner go a little smoother. 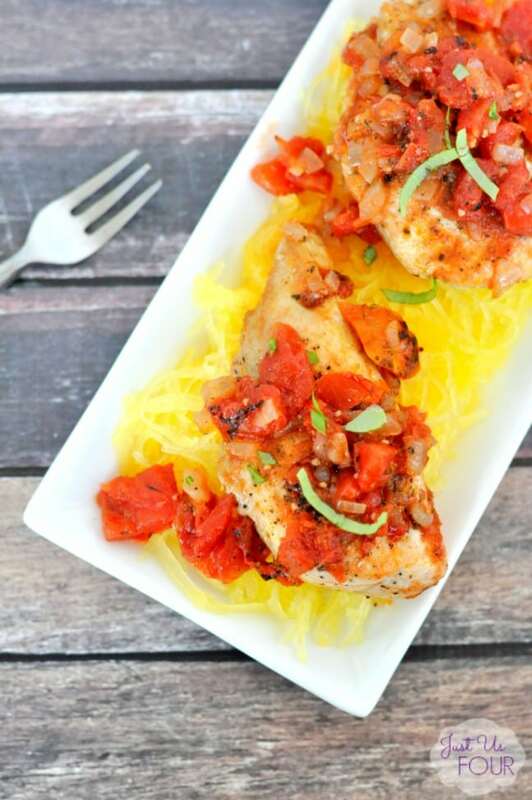 Perfectly seasoned and tender chicken is cooked with garlic and fire roasted tomatoes. Serve it over a bed of pasta or with fresh sautéed vegetables for an easy family dinner. One pot meals are my favorite. They really make it easy to get dinner done without a lot of dishes to clean up in the aftermath. 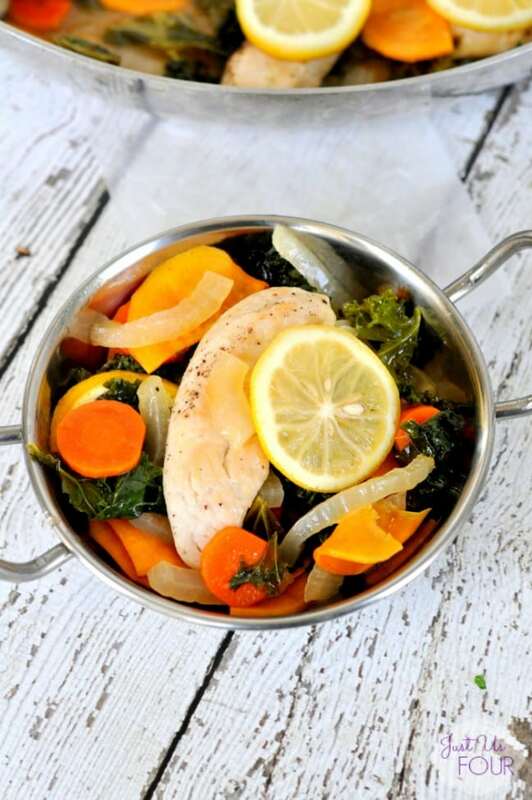 One of my favorite one pot dinners right now is this fresh paleo one pot chicken and kale. This recipe is so simple, but the fresh ingredients give it an amazing taste that the whole family will love. It’s a filling and healthy dinner that you can feel proud serving to your kids on a busy night. It is easy to rework classic Mexican dishes like green chicken enchiladas to eat a little healthier and cut out some of those calories! 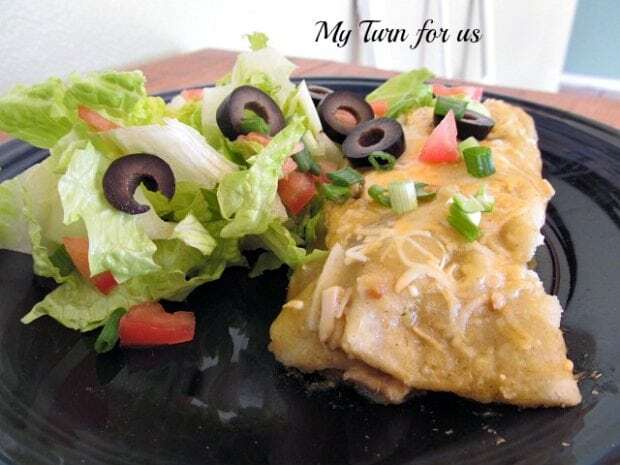 These Skinny Green Enchiladas contain healthy ingredients like white chicken breast and low fat cheese, with maximum flavor from chopped jalapeno peppers, sliced black olives, and delicious green enchilada sauce. Serve them with plenty of fresh lettuce and veggies! If you are looking for a comforting and creamy chicken dish, look no further. 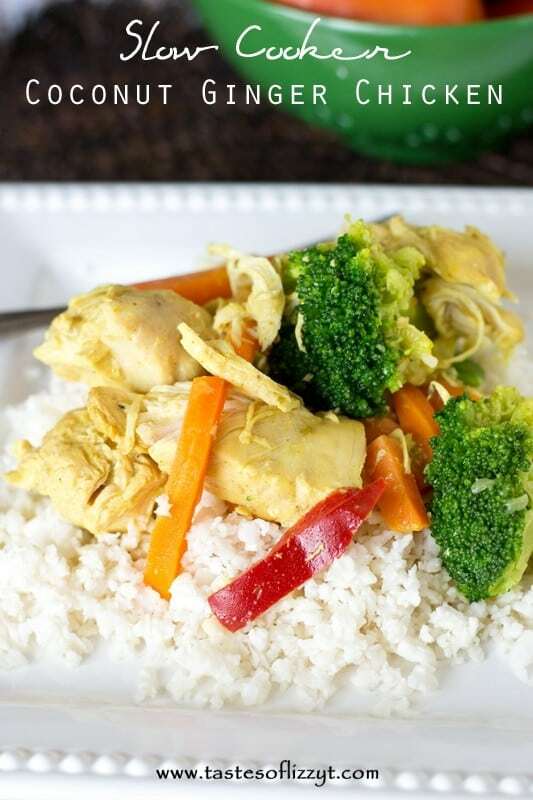 This Slow Cooker Coconut Ginger Chicken is a simple dinner that is approved for paleo, grain free, and dairy free diets. Coconut milk gives the chicken its super creamy texture, and it is cooked with a medley of vegetables including broccoli, peppers, and mushrooms. On a busy schedule, meals that can be prepared in advance and warmed on a time-crunched evening are invaluable. Sometimes you just need a light meal on the healthier side to wrap up your day. 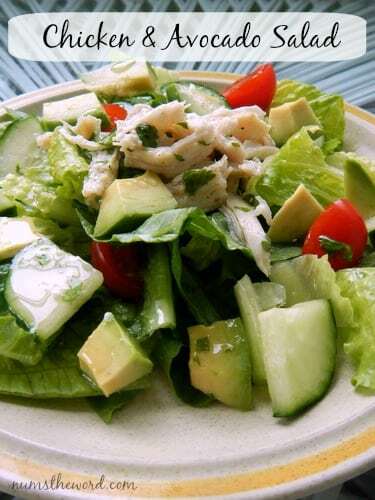 For dinner, this Chicken and Avocado Salad is a flavor packed meal that is refreshing and tasty. We like to serve it as a salad bar so each person can customize their own salad and choose how much dressing they would like. If fresh vegetables and tender shredded chicken isn’t enough, the cilantro lime dressing will win you over for sure. 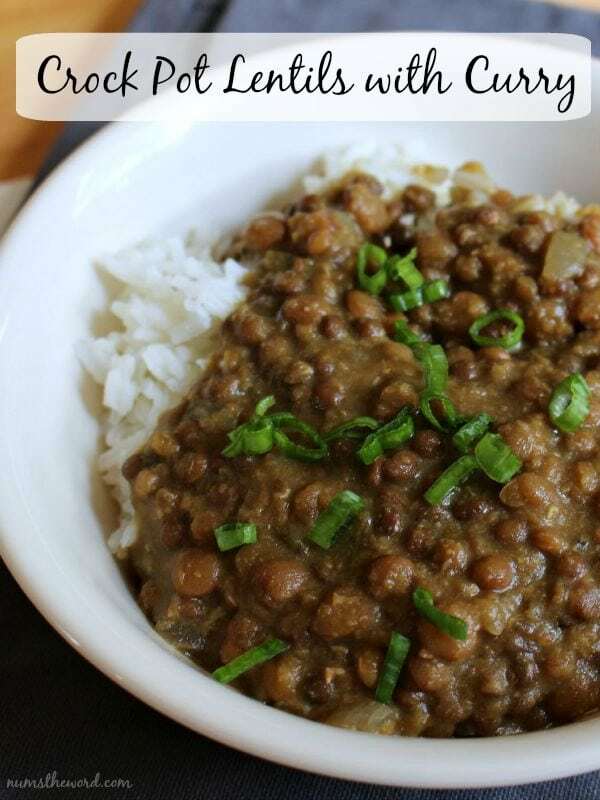 This recipe for Crock Pot Lentils is seriously one of the best crock pot meals that I have ever tried. There are quite a few spices that you might not have used before, but I guarantee they taste amazing and are easy to find at your local grocery store. Creamy and loaded with coconut milk flavor, it tastes delicious served over a bed of fresh cooked rice. The recipe also makes a lot, so you can enjoy some the night of and freeze the rest for delicious meal another night. This Greek Chicken Souvlaki turns out tender and so flavorful, and the Lemon Rice compliments the dish so well. 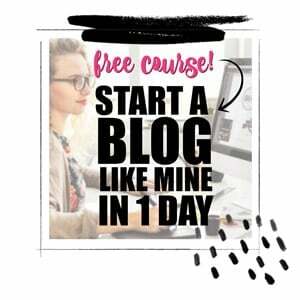 It is easy to make and a real crowd pleaser. It’s the perfect weeknight dinner for anyone who loves the fresh, bright flavors of Greek food. I even made extra last time and put chicken and marinade in a bag together to freeze for an easy meal later on. 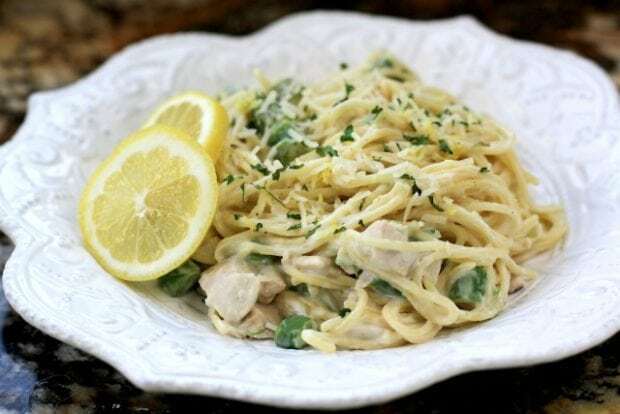 This simple Creamy Lemon Chicken Pasta makes an easy and lovely family meal for busy weeknights. It’s easily made with fresh asparagus spears, juicy chicken, and a squeeze of fresh lemon juice. The light and creamy sauce is the perfect complement to the fresh flavors, tying together the other incredibly satisfying flavors. This pasta dish comes together quick and is a breeze to make. Crockpot recipes are go-to dinners in our house. 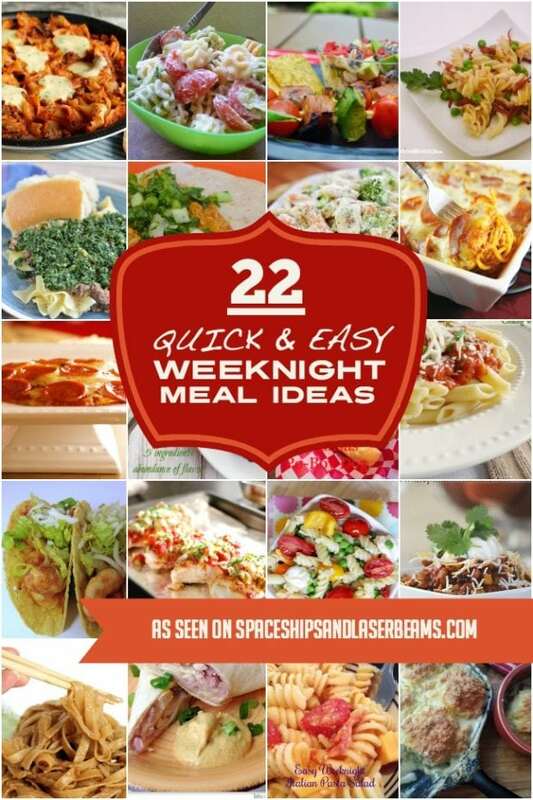 They are easy to throw together and it is so nice to come home to a cooked meal after work! 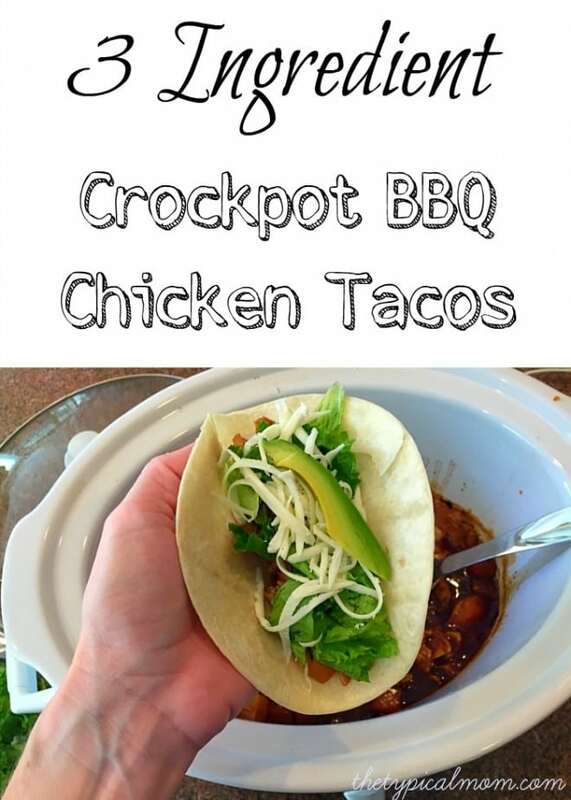 This easy crockpot BBQ chicken literally only uses three simple ingredients and can just get thrown into the crockpot before you leave in the morning. The chicken is super tender and full of flavor, perfect for shredding and serving as tacos! Fill a corn tortilla with shredded chicken, avocado, and shredded cheese. 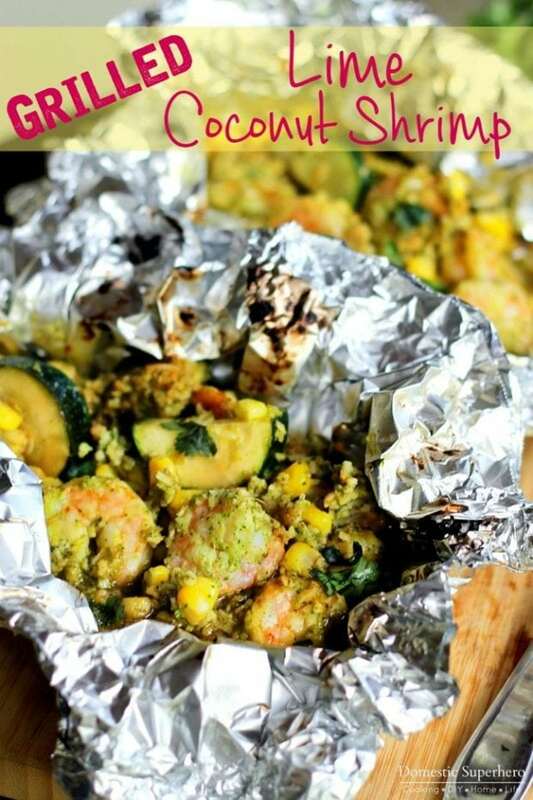 Grilled Lime Coconut Shrimp Foil Packs are easy, healthy, and out of this world delicious. Fire up your grill and get ready. The shrimp gets marinated in a yummy cilantro lime mixture overnight, then grilled in foil packs with fresh vegetables like zucchini and corn. They taste delicious on their own, but can also be served over fresh steamed rice or tender quinoa. 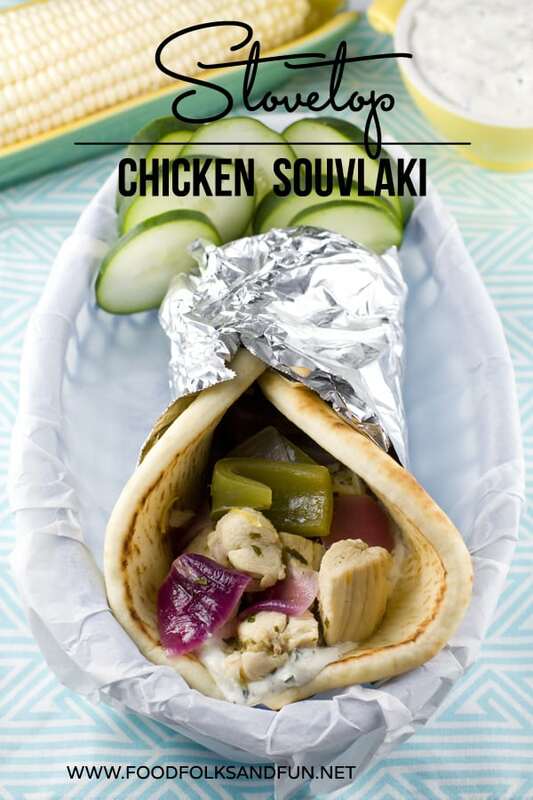 I am kind of in love with this recipe for Stovetop Chicken Souvlaki. The chicken is so tender and the whole dish is bursting with bright, fresh, Greek flavors. Serve this meal with fresh corn on the cob and cucumber slices with extra Tzatziki for dipping. You can even whip up some Greek inspired cucumber sliders. This is a quick and easy weeknight meal that the family will love. 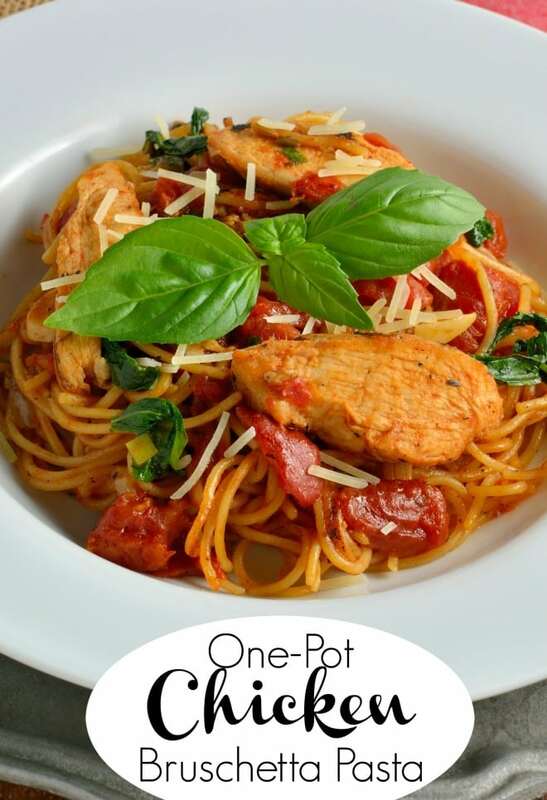 Make a delicious and healthy dinner for your family in just twenty minutes with this One Pot Chicken Bruschetta Pasta. Bruschetta, a classic Italian appetizer loaded with fresh tomato and savory garlic flavor, can also make a wonderfully simple and flavorful pasta. 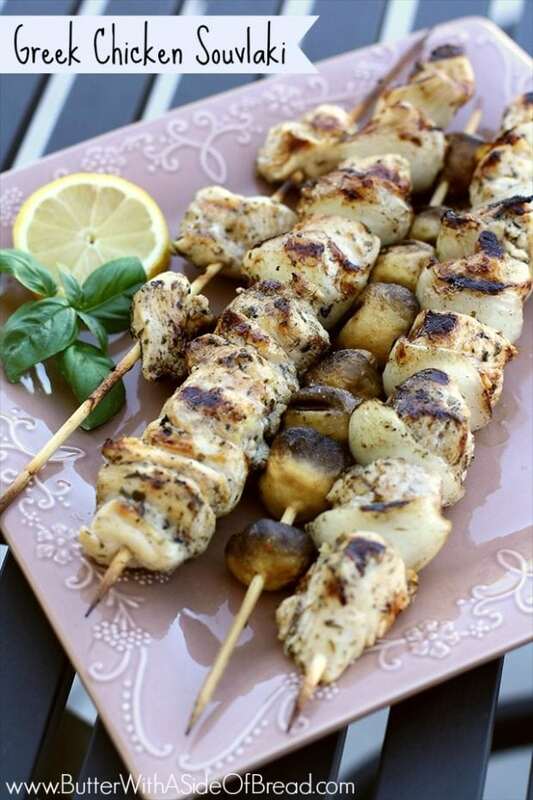 This recipe adds some tender grilled chicken strips for a boost of protein. The best part is that this whole meal is ready to eat in just twenty minutes. 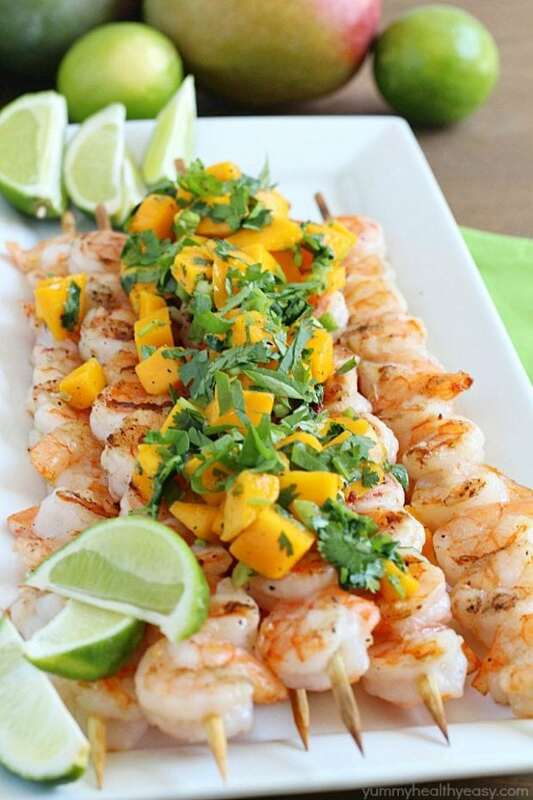 Grilled shrimp skewers with homemade mango salsa just screams summertime. Fresh shrimp is marinated in a simple garlic and oil marinade, adding so much flavor to the shrimp. And then there is the mango salsa, which is crazy easy to make and can be served right on top of the shrimp or on the side with some steamed rice. These skewers are perfect for entertaining, too. They are easy, healthy, and absolutely delicious. What healthy dinner idea are you ready to cook?